We are in a desperate position today at Bosavern Community Farm as the Co-op Bank has turned down a mortgage for us to buy the farm. The Lottery has said we need to buy the farm by 30th November or it will retract its offer of £215k. 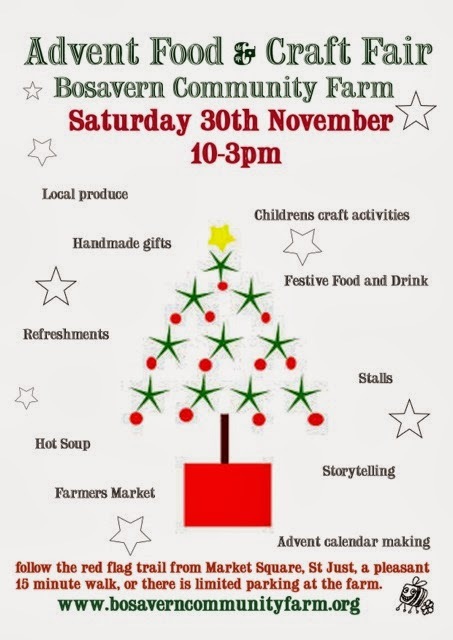 Bosavern is doing so well with a real bumper year of food, we've had all the local schools up learning about where our food comes from, workshops galore and community events. Please don't let us lose this great community asset. WE NEED A LOAN OF £100 000. That could be 1000x£100 or 100x £1000, to buy the farm by tomorrow. Please forward this to anyone who may be able to help. Preparing to re-skin the old polytunnel. Over the past ten days we have been renovating our oldest polytunnel. This tunnel, the Mothership, was already on the farm when the community came here, and we believe it to be 10 to 12 years old. 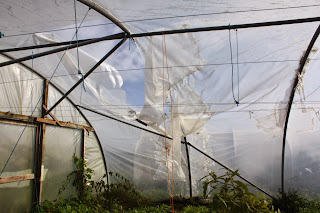 Within a year of us being here the front timbers were starting to come apart, being unable to cope with the weight of tomatoes pulling on them. 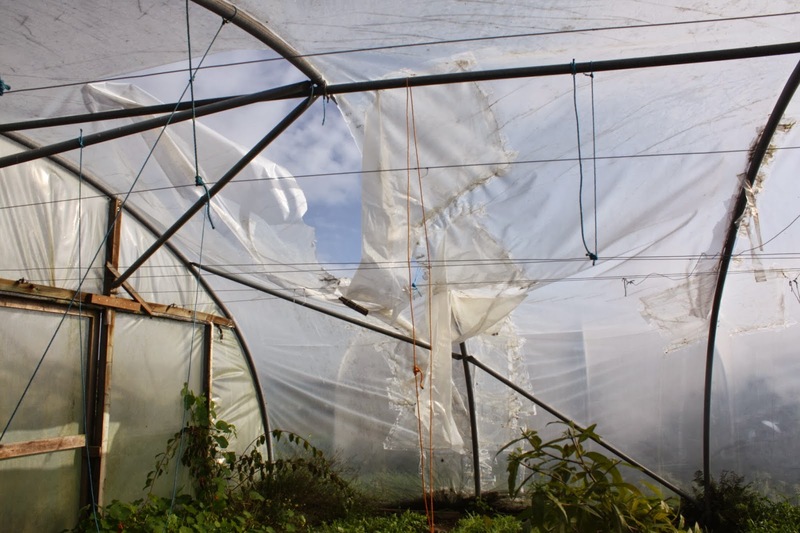 We have continually patched and repaired the tunnel, but strong winds earlier this month started to tear it apart drastically. Both the plastic and timber needed replacing, so we spent two days digging these out and removing them. 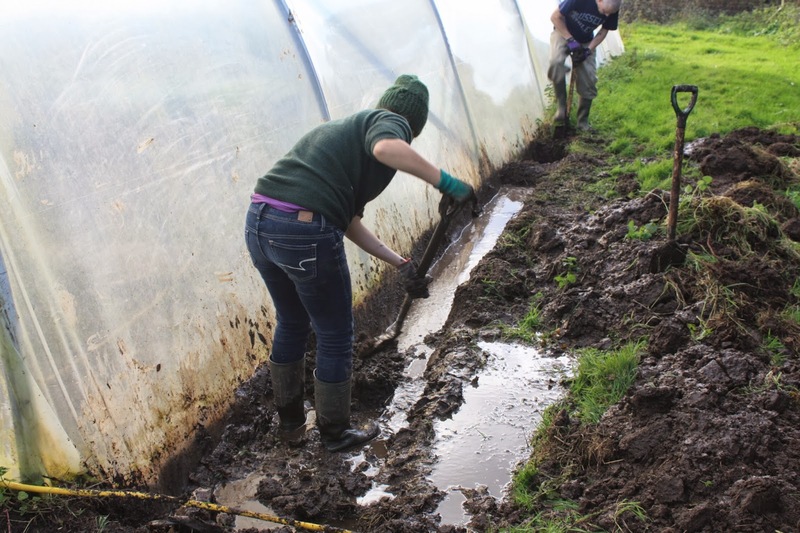 Rebecca and Chris digging the old plastic out (after lengthy heavy rain!). Front timbers removed, but plastic still on. A strong overnight wind did most of the work of removing the plastic for us. 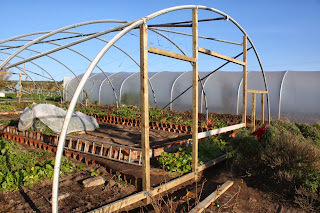 Once off we reconstructed the timber ends of the polytunnel both front and back, finishing this work today. We have also constructed new windows and doors or repaired the old ones, and covered these ready to be re-hung, and begun adding the additional plastic panels at front and back. Back end timbers replaced and ready for plastic. The tunnel will be ready to re-cover on Thursday 28th November. The weather forecast is good, with low winds and no rain, and we are aiming for a 9 am start (subject to alteration...). Our usual volunteer session will start at 10 am, but if our regular volunteers can come one hour earlier that would be much appreciated. We are hoping for 10 people, until the cover is secured, and already have 5, so please come along and join in. Farmers' Market, Advent Fair, and Shop Opening. 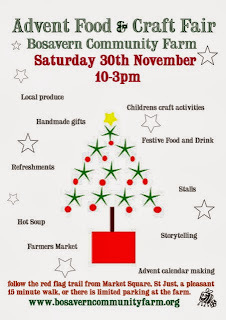 This Saturday 30th November there will be a farmers market and craft fair here on the farm from 10 am till 3 pm, with activities based on the beginning of Advent. During the event we will also be opening our brand new farm shop for the first time, selling mainly produce from the farm, but also selected goods from the surrounding area. Please do come along and support your community farm! Advent food and craft fair. From tomatoes to winter salads. Over the past two weeks we have converted our biggest polytunnel from tomatoes (with a few aubergines, tomatillos, physallis, squashes and courgettes thrown in) to winter salads. First we harvested the remaining tomatoes, both red and green (for chutney), pulled out all the plants, chopped them up and added them to our compost bins. Then we rolled up the woven black plastic mulch, marked out beds of 1.2m width, and dug them over to a spades' depth removing any living couch roots we found (not many, surprisingly). With a good team of volunteers this took two days. 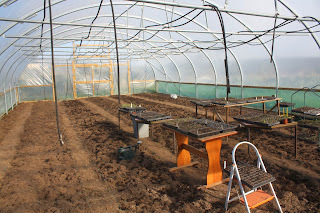 The beds all dug over, and trays of salads ready to plant. We had sown thousands of salad seeds into modules one month beforehand, so they were ready to plant when the time came (although they were quite small, we're not sure the compost was good enough quality). So we relaid the irrigation pipes, added four more, and planted salad seedlings 10cm apart in two lines, one either side of each irrigation pipe, making 24 lines of salad in total. 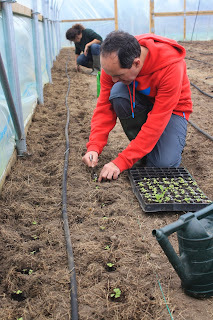 Martin and Rebecca planting the first salad seedlings. The plants have responded well to getting their feet into the soil, and we hope to start harvesting them in early December. We planted a mix of brassica salads (mizuna, mibuna, rocket, senposai, tat soi, serifon, sessantina, shungiku etc.) plus winter spinach, claytonia, watercress, and red salad bowl lettuce. As always, many thanks to all our volunteers for their invaluable help. 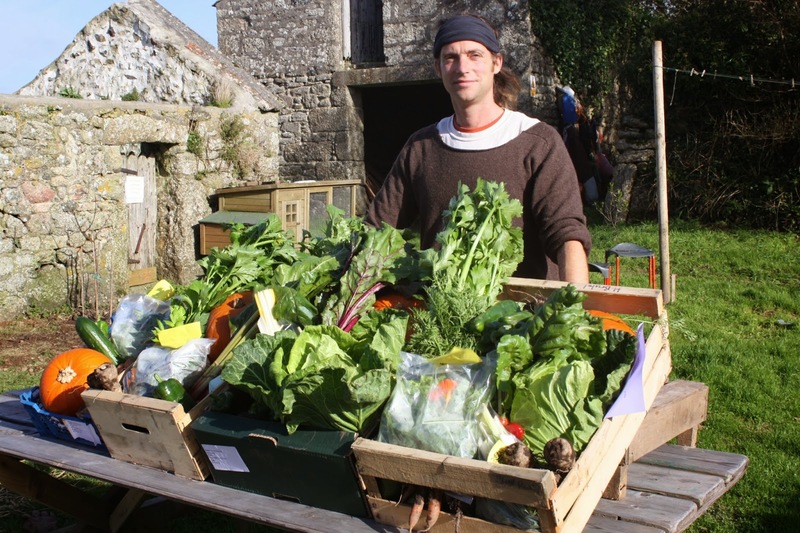 We love our produce and need enthusiastic people to help us sell it and join the team. We are looking for help either mornings or afternoons. If you are interested please contact Yvonne on 01736 788454 or yvonnebristow@blue-earth.co.uk. 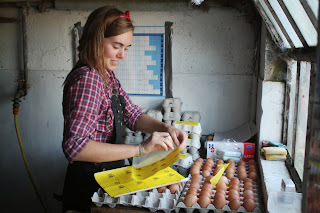 Nyssa, our 100th WWOOFer, has just left us after six weeks volunteering on the farm. Nyssa was a pleasure to work with and a real asset to the farm during her stay. We wish her all the best in her onward travels, and a happy Thanksgiving back home. On Wednesday afternoon last week I gave a talk to St Just U3A about developments at the farm over the past three years. It's always good to give talks like this because it makes you realise how far you've come! Below is one example, showing roughly the same view on our vegetable field in September 2010 and again in September 2013. 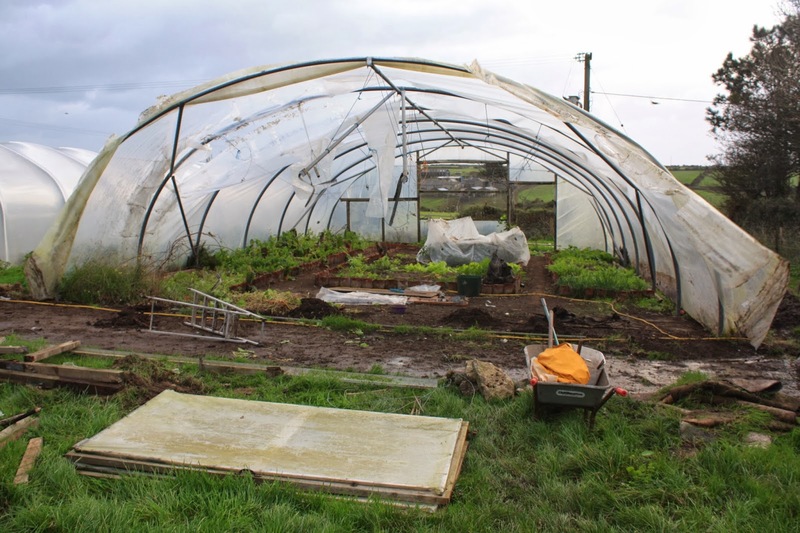 2010 - one polytunnel and a field of weeds. 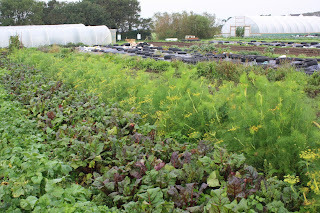 2013 - three polytunnels and a field full of crops. This year we have fifteen each of 3 different breeds of turkey for Christmas. Roly Poly is a white bird, costing £10 per kilo, with expected weights of 6 to 12 kg per bird. Kelly Bronze is an all-rounder, costing £11 per kilo, expected weights of 5 to 10 kg per bird. 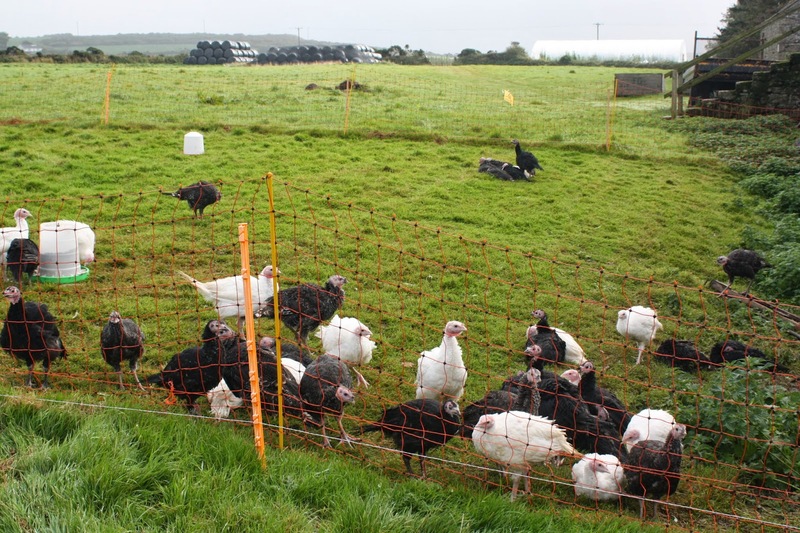 And Norfolk Black is the gamey turkey we have raised for the past two years, costing £12 per kilo, expected weights of 5 to 10 kg per bird. Our free-range turkeys outside in their large run. Please order your turkey now to avoid disappointment - we are asking for the usual £20 deposit - by phoning 01736 788454, or email lynne@bcents.org. They will be ready for collection on 23rd December, having been freshly prepared the day before. Our veg box scheme has been running since June 2011 without a break, and our boxes have never looked better. Here you can see James, the farm's Produce Distributor, proudly displaying the four sizes of veg box on offer. These are, from the left, small at £7 each, standard at £10, large at £14, and mega at £20. 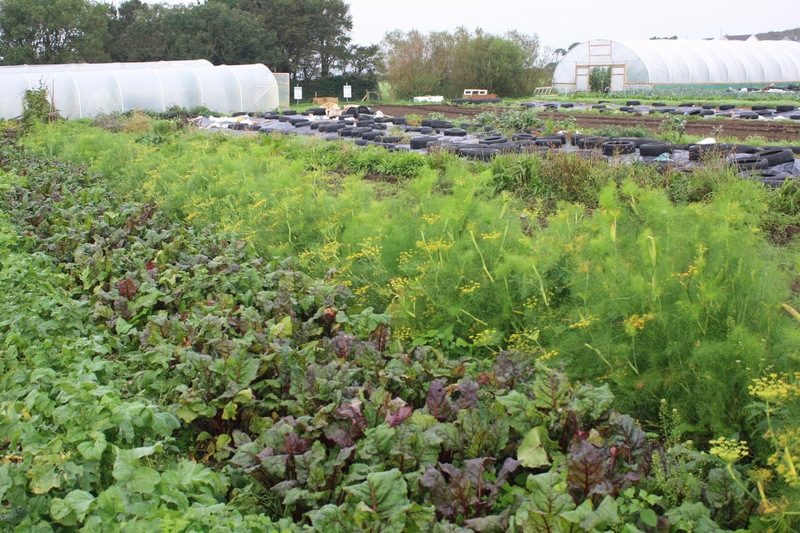 Boxes are available either weekly or fortnightly, and can be collected from the farm or local hubs, or delivered to your door depending on location. 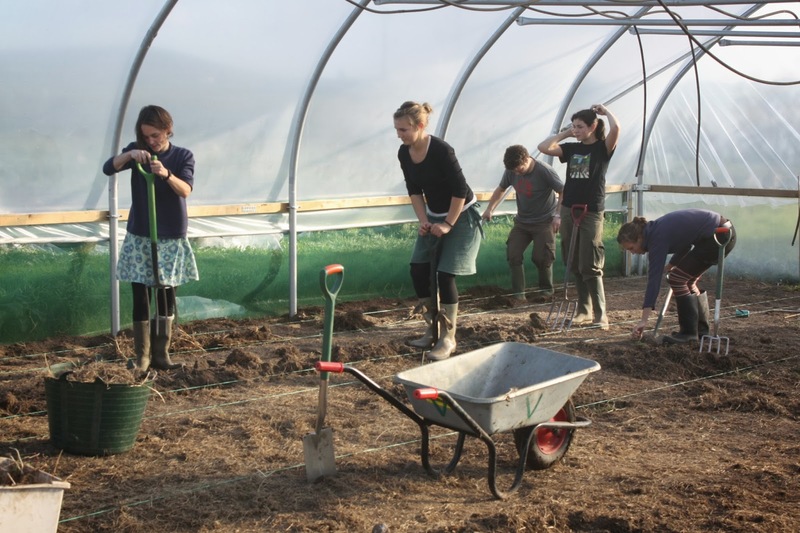 Please contact us for more details, by emailing vegbox@bcents.org or phoning 788454. Halloween veg boxes each included a whole pumpkin for carving (Friday 25th October). Small box - one bunch of carrots, one cauliflower, 200g of chard, one cucumber, half a kilo of onions, one pepper, and half a kilo of Charlotte potatoes. Standard box - one kilo of beetroot, one bunch of carrots, one cauliflower, 200g of chard, one chilli, one leek, half a kilo of onions, half a kilo of parsnips, half a kilo of Charlotte potatoes, one black winter radish, and a salad bag. Large box - one kilo of beetroot, one cabbage, one bunch of carrots, one cauliflower, one head of celery, 200g of chard, one cucumber, 200g of kale, 2 leeks, one kilo of onions, one kilo of potatoes, one black winter radish, and one salad bag. Mega box - one kilo of beetroot, one cabbage, one bunch of carrots, one cauliflower, 2 heads of celery, 200g of chard, one chilli, one cucumber, 200g of kale, 3 leeks, one kilo of onions, one kilo of parsnips, 2 peppers, one kilo of potatoes, one black winter radish, one salad bag, and two butternut squashes. All of this produce came from the community farm, harvested fresh on the day (except for onions and potatoes which are in storage), and was grown to Wholesome Food Association principles. Friederike and Charlotte are currently hitch-hiking to Bristol after spending one month wwoofing on the community farm. We'd like to thank them for their valuable contributions during their stay here, and wish them the best for their forthcoming wwoofing in Italy. 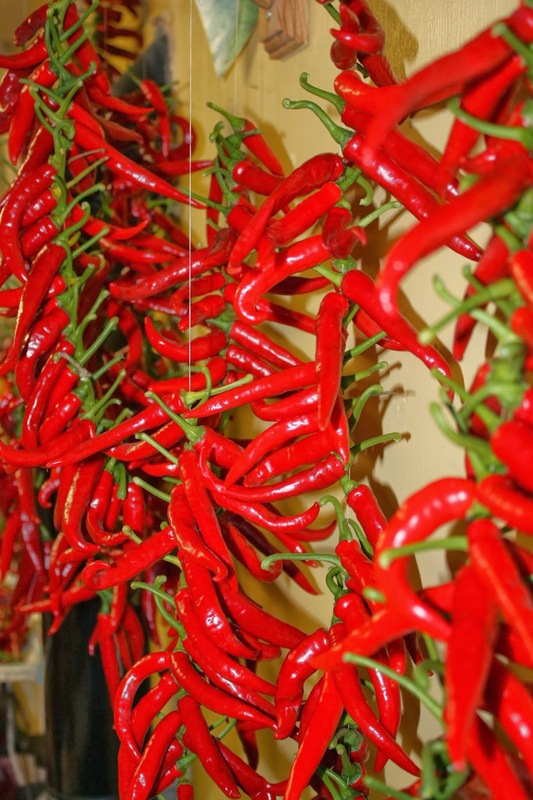 Last Sunday we harvested almost 1000 "ring o fire" chillies, and threaded them to dry hanging around the Rayburn stove in the farmhouse kitchen. 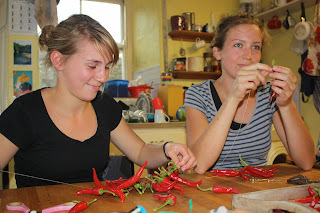 Using a needle and thread, we sewed the chillies together by pushing the needle through the thick part of the stalk near its base, then hung them in the warm and dry for 2 or 3 weeks. They should then store for several months, depending on the damp. 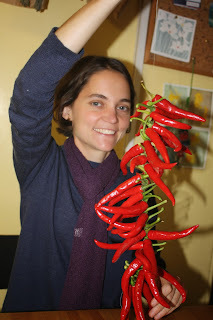 Alice with a string of chillies. 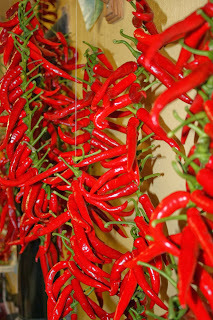 Chillies strung and hung in the kitchen.